Introduction: The Mini-Gastric Bypass has been shown to be more effective than the RNY, the Band or the Sleeve with lower complication rates than the Biliopancreatic diversion. Surgeons who do not recall the past experience in peptic ulcer disease (PUD) surgery criticize the MGB because of a fear of bile reflux causing gastritis and marginal ulcer. 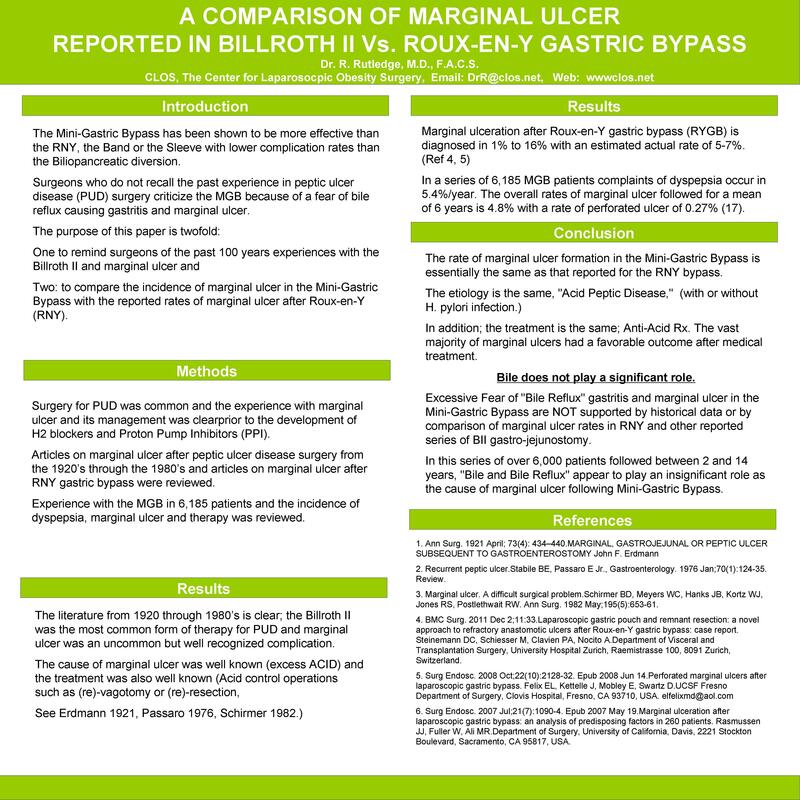 The purpose of this paper is twofold: one to remind surgeons of the past experiences with the Billroth II and marginal ulcer and two: to compare the incidence of marginal ulcer in the Mini-Gastric Bypass with the reported rates of marginal ulcer after RNY. Surgery for PUD was common and the experience with marginal ulcer and its management was clear prior to the development of H2 blockers and Proton Pump Inhibitors (PPI). Articles on marginal ulcer after peptic ulcer disease surgery from the 1920’s through the 1980’s and articles on marginal ulcer after RNY gastric bypass were reviewed. Experience with the MGB in 6,185 patients and the incidence of dyspepsia, marginal ulcer and therapy was reviewed. Marginal ulceration after Roux-en-Y gastric bypass (RYGB) is diagnosed in 1% to 16% with an estimated actual rate of 5-7%. In a series of 6,185 MGB patients complaints of dyspepsia occur in 5.4%/year. The overall rates of marginal ulcer followed for a mean of 6 years is 4.8% with a rate of perforated ulcer of 0.27% (17). The rate of marginal ulcer formation in the Mini-Gastric Bypass is essentially the same as that reported for the RNY bypass. The etiology is the same, Acid Peptic Disease, with or without H. pylori infection. Also; the treatment is the same; Anti-Acid Rx with bile not playing a significant role. Fear of bile reflux gastritis and marginal ulcer are not supported by historical data or by comparison of marginal ulcer rates in RNY and BII gastric bypass. In this series of over 6,000 patients followed between 2 and 14 years, bile appears to play an insignificant role as the cause of marginal ulcer.